A group linked to al-Qaeda suspect Abu Musab al-Zarqawi has said it carried out the attack which killed Iraqi Governing Council head Ezzedine Salim. The Monotheism and Jihad Group, of which Zarqawi is said to be the leader, made the claim in a statement posted on an Islamist website. 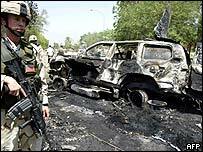 Officials from the US-led coalition have said that Monday's suicide attack bore all the hallmarks of Zarqawi. A previously unknown group has already said it was responsible. Military spokesman Brigadier General Mark Kimmitt said the US was investigating the statement of the Arab Resistance Movement al-Rashid Brigades, which could itself be a cover for the Zarqawi network. Mr Salim was near the headquarters of the US-led coalition in Baghdad when a bomber blew himself up early on Monday. It is not yet clear whether Mr Salim was the target of the suicide attack which killed several other Iraqis. But the Monotheism and Jihad Group's statement said its fighters were "determined to lift the humiliation from our nation". "Another lion from the Jamaat al-Tawhid and Jihad has removed the rotten head of those who betray God and sell their religion to the Americans and their allies," the statement said. Zarqawi is also believed to have carried out the beheading of US contractor Nicholas Berg. The US has offered a $10m reward for information leading to his death or capture.